Experience the wonderful hospitality and amenities of our hotel in Salem, Oregon. Sleep well at the Hampton Inn & Suites Salem hotel in a clean and fresh Hampton bed® and stay in touch with friends and colleagues with free internet access available in every guest room. Watch your favorite shows on the 43-inch LCD HDTV, and start each day with a freshly brewed coffee from the in-room coffee machine. Every guest room at this modern Salem hotel also includes a hair dryer, ironing equipment and shower amenities. Our hotel in Salem, Oregon has several other services to help your stay go smoothly. Pick up snacks, drinks and other supplies, day or night, from the Suite Shop, and keep your valuables secure in the hotel’s safety deposit box. Swim laps in the hotel’s saltwater swimming pool and maintain your fitness routine on the road in the fitness center with a range of cardiovascular machines and weights. Keep up with work at your spacious desk and sit comfortably in your ergonomic chair. Enjoy Hampton’s free hot breakfast every morning in the spacious, bright breakfast area at this Salem hotel. And every Tuesday, Wednesday, and Thursday is a complimentary evening reception for guests. Stay on top of work in the business center equipped with fax, photocopying and printer access. Host your meetings in the hotel’s 851 sq. 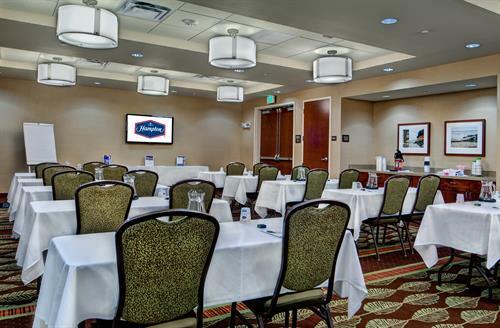 ft. meeting room, which accommodates up to 96 guests in a range of seating styles. If you need anything else, don’t hesitate to ask our friendly multi-lingual staff, who will be happy to make your visit extra awesome. Heading South on I-5, take Exit 253. Keep right at fork and go West. Turn right at 1st light (Hawthorne Ave. SE.) Heading North on I-5, take Exit 253. Turn left onto OR-22W. Take 1st right.